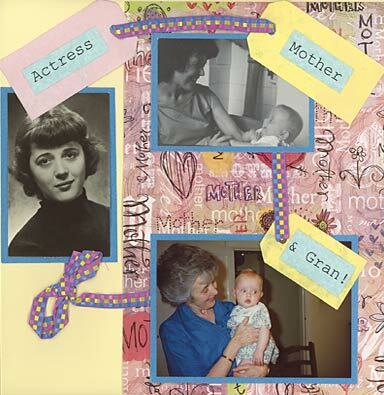 Whether you love mothers day scrapbooking, or even mothers day card scrapbooking if you like cardmaking - you know that the mother in question will always appreciate it! As I set about my mothers day layout, I thought about the journey my mother took from acting school to motherhood and eventually to 'grandmotherhood' (if there's such a word), and I thought I'd try and suggest a journey on my layout with a baggage label effect. I used vellum 'tickets' in pink, cream and blue plus lettering that's meant to suggest the sort of plain, functional font found on travel tickets. The attractive paper design by the excellent Karen Foster makes a layout something you want to look at again - even if you're not happy with your own contribution! I wanted to create this 'timeline' idea of my mother's life journey, so I felt that physically threading the photos together would be worth a try. This colourful ribbon is from 'Scrappy Do's, an unfortunate name for a rather nice ribbon! MOM KNOWS BEST - HAVE A PLAN BEFORE YOU START! Not being a card maker myself, I would have to defer to other sites that specialise in cardmaking. All I'd say is that whatever you decide to create for your mother, it will be received as the special, personalised gift that it is.